And…It’s a GIRL It’s a GIRL It’s a GIRL!!! Gabriel and I are beyond excited to share our happy news, we’re bringing a babygirl into this world and I seriously couldn’t be happier!!! I of course just prayed for a healthy, happy baby, and eventually want one of each, but I was secretly really hoping this baby would be a girl! Gabriel is a special man, sensitive and patient, so amazing with his niece Mya and all of my nieces, so I know he’ll be such a good daddy to his own babygirl! Thank you to all of our amazing friends and family that were there and on FaceTime to share the moment with us!!! It was literally the most exciting moment I can think of in my life! I felt like a little kid again on Christmas morning with so much excitement before we cut that cake and opened that box of balloons! Pink or blue, that’s all I could think about for days… This day would change our lives from here on out. Little boys and little girls are both so special in their own ways, but so incredibly different. I think my heart stopped when I cut into that cake and saw PINK! This past Sunday we threw a very impromptu gender reveal party for a few close friends and family. I hope some of you were able to catch it on IG stories and if not, I’ll be sharing all my favorite moments from the party here and on my IG throughout the week. Believe it or not, we put this party together in 4 DAYS!! Crazy right?! We were having such a busy week and couldn’t decide on the day, but as my bday gift this year, I really wanted to find out if this baby was a boy or girl! So thankful for my Mom and Dad, hosting the party at their house and my friends, especially Luisa and Kat, for helping plan and get everything together in such short notice! I wasn’t sure we could pull it off, but I’m beyond happy with how everything turned out!! Every detail from the balloons, desserts, to the set-up turned out exactly as I’d hoped it would ♥ I went for a white, silver and of course baby blue and pink theme. The room was filled with lots of balloons, stuffed animals, baby photos of G and I and our sonogram photo of our little girl, flower arrangements, and a cute pink & blue themed dessert table with cookies and Rice Krispie treats that my mom, best friend Lu, and I hand dipped the night before!! It was such a magical day, having everyone together to share our special moment ♥ And I loved seeing everyone’s reactions! Loved my gender reveal stork cookies by the very talented Christina Ramsey @luxe.cookie!! My best friend told her the baby is a girl in advance so when you bite down into the cookie, the cookie dough was PINK!!! How cool is that?! And love the adorable illustrations and details on these cookies..delicious and too pretty to eat! And the cake..so gorgeous and exactly what I imagined!! Thank you @cakeandart for this delicious 5-layer masterpiece :) The cake batter was also dyed pink so we couldn’t cut into it until the big reveal! Finally time to find out!! G opened the box of balloons while I cut the cake! So much anticipation leading up to this very moment and it was so special to find out the gender surrounded by the people we love so much! Not only was this cake stunning, but it tasted so GOOD!! I’ve been eating a slice everyday since! Can’t thank you guys enough for all your love and support these past few days! I’m overwhelmed with happiness and can’t wait to share more of this journey with all of you. ahh your gender reveal party is the cutest I have ever seen. you are so immaculate about details, colour scheme- it’s pure perfection as yourself. You two are such a beautiful couple inside out and no words could express how happy I’m for You two and your little munchkin. I look forward to see more of Your beautiful moments. Who is your romper by? Happy belated birthday and congrats on the baby girl! She’s going to be so gorgeous just like her mom :) btw you kept the secret so well! I would never have guessed you were pregnant before you announced it. So happy for you both, you two and your home are goals!! That little girl is going to be so loved!! Congrats again babe. A gorgeous baby girl! You guys must be so excited! The reveal was beautiful, lady! Wow. This must have been the best and cutest gender revealing party ever. So many so gorgeous details. Enjoy your pregnancy. Congratulations!!!! How gorgeous are you! You’re glowing momma-to-be! 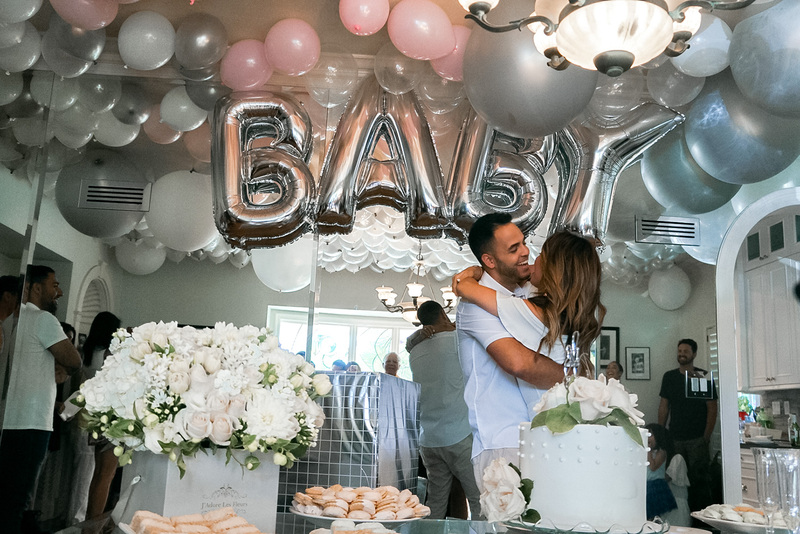 Your gender reveal party was a DREAM! Awww thanks Tasha <3 <3 Can't wait to share more details soon! Congratulations! You two are absolutely beautiful! The party was so well put together, the photos look like you’ve had a lot of fun! Thanks babe<3 <3 More pregnancy updates coming soon!! Congratulations babe! I’m so happy for you and how wonderful, a girl! Wish you a fabulous weekend! Babe this is so exciting! the best news ever!!! I love seeing all your pictures and reading the post, can’t wait til the baby is born, sending much love and congrats to both of you! Wow! Congrats girl! Thanks for sharing this exciting news, really love readings posts like this. – full of love and happiness. Wishing you all the best on your new quest in life – motherhood. This definitely has to be one of the best posts you’ve ever published!! I’m sooo beyond happy for you Jessi!! Congratulations on getting this party together within 4 days and ITS A GIRL!! I wish you both the best and still cannot wait to follow you both on this incredible, once in a lifetime adventure!! Congratulations on your baby girl babe! I’m so happy for you! YAY! I know boys and girls are equal, but I think there’s something so exciting about having a baby that’s your own gender, purely because of the things you can share with them. Your clothes, your boy advice, everything. I’m so excited for you, Jessie! The party looked incredible. I did miss the IG stories unfortunately, but I will keep checking back on your Instagram! Thanks love <33 G & I are so excited to have this lil one! We already have outfits planned out for her! I love how I can share this journey with you guys! Congrats! I have two girls and they are both a blessing in my life. Love the idea of having a gender revealing party, so cute! So exciting you’re having a girl! Can’t wait to see all the cute outfits she has! The reveal party looked amazing! Congrats! Loved your reveal party! I am planning one this weekend and was wondering if you could please provide the recipe details on the pink and blue dipped cookies? I am interested in making those myself! Thanks so much!